There are three cable car routes in operation all with close access to Annie’s Cottage San Francisco. 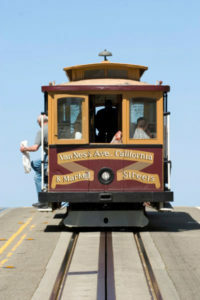 At Powell and Market streets, there is a cable car turntable which serves as the beginning stop for two lines, the Powell-Mason and Powell- Hyde lines. The Powell-Mason line begins at the Powell/ Market turntable, and the line runs up and over Nob Hill San Francisco and down to Bay Street at Fisherman’s Wharf. The Powell-Hyde line also begins at the Powell Market turntable runs over Nob and Russian hills before ending at Aquatic Park near Ghiradelli Square. Both these lines end near Fisherman’s Wharf, but at different areas, and the routes are significantly different. 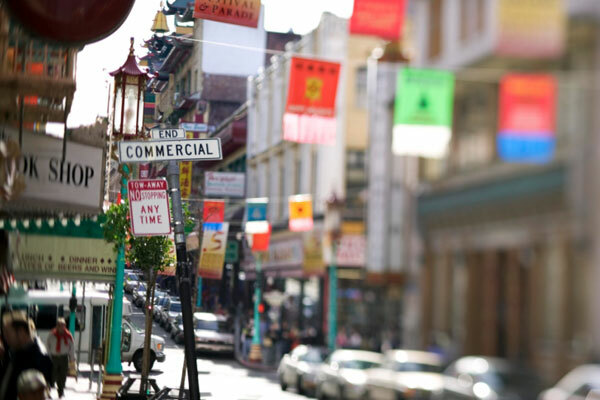 Paying close attention to the signs on the cable cars will help you distinguish where in Fisherman’s Wharf you will find yourself. 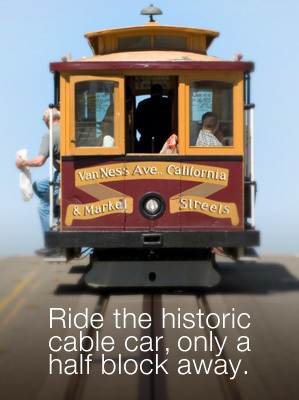 You will find access to the Cable Car line just a Half block from Annie’s Cottage, on Russian Hill in San Francisco, CA.